The killings of two black men in Ferguson, Missouri and New York City last summer, and the riots and protests that followed into the fall, brought America’s always-simmering racial tensions to a boil. 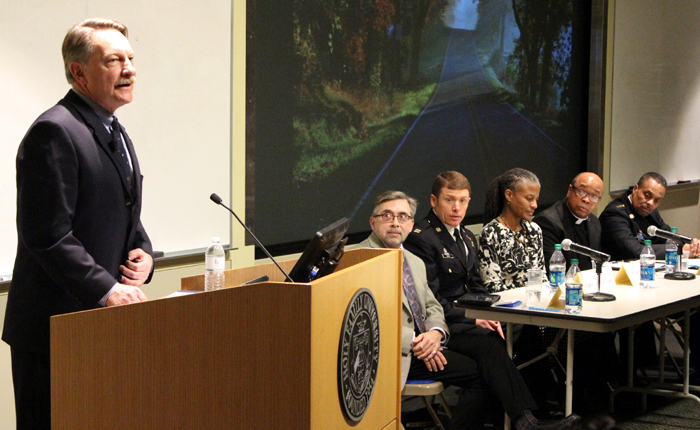 Reflecting on the current state of race relations and how to improve them was a panel of experts including a Catholic priest, police officers and college professors who joined a panel discussion Thursday, Jan. 29 titled “Life After Ferguson: Where Do We Go From Here?” at Holy Family University in Northeast Philadelphia. More than 50 years after King wrote those words, the problem of violence, crime and the reaction to it by police officers remains a key source of racial tensions. But the panelists agreed that people’s sense of powerlessness leads to crime, and is itself rooted in poverty and joblessness. Philadelphia Police Captain Michael Cram told the story of how in his 25th Police District in North Philadelphia, which has the highest crime rates in the city, officers organize a toy drive for neighborhood children each Christmas. He was struck by children’s requests for mattresses to sleep on and windows in their home. Cram said he and other city cops try to make connections with people in the poorest and most violent neighborhoods of the city by walking the streets and speaking with men on the corners and parents in their homes and in community centers. “Ferguson is not the issue, walking kids to school is,” he said. The most important thing for those parents is getting their children to school safely where they receive two good meals a day, so they want police to shut down a drug corner. Listening to residents and walking the beat has become second nature to Cram, an Army Reserve veteran who did similar community-building work while on deployment in the war-torn streets of Iraq and Afghanistan. It’s also a strategy that means a lot to Father Stephen Thorne, who as pastor of St. Martin de Porres Parish in North Philadelphia is a resident of the community where his parishioners live. While he recognizes some black people and some police officers fear one another, he feels safe when he sees an officer walking the beat on Lehigh Avenue where his rectory is located. He thinks more of that is needed, as are more opportunities for people to see and engage each other who otherwise would not do so. “We need to build connections between people and police and build that intentionally. We need more of this, to have honest conversations and see a person as truly a human being,” Father Thorne said. 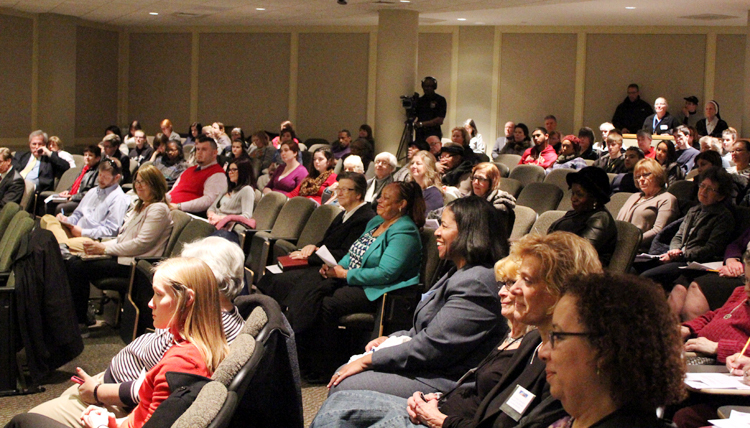 About 150 guests filled a Holy Family auditorium, about 50 of whom were university students. 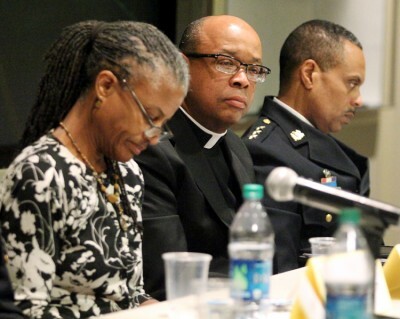 The panel they listened to included Father Thorne, Captain Cram and his superior on the police force, First Deputy Commissioner Richard Ross Jr., as well as Anita Foeman, communications professor at West Chester University; Delores Jones-Brown, professor at John Jay College of Criminal Justice; and Donald Brash, theology professor at Palmer Theological Seminary, the Protestant seminary at Eastern University in Radnor. All the panelists praised the forum for bringing together people to listen and talk about race relations and building relationships among all peoples, something they said needed an intentional effort to be done more often. They suggested that too often, conflicts erupt when people do not know one another and when they do not recognize their relationships with each other and with God. “In Ferguson, if the officer and the young man had known one another, the outcome might have been different,” Foeman said. Confrontations between police officers and young black men ending in deadly violence are tragic but nothing new. What made last year’s incidents a cultural phenomenon that swept through the nation and raised issues of race and violence into a renewed national conversation was the use of social media. The panelists panned mainstream media for sensationalizing the events. But it was Facebook, Twitter and other tools that spread word of the shootings widely in a person-to-person fashion. When protests began springing up in cities all over the country, they were largely organized by people spreading the word through those same channels. He added that it is important to bring together people who otherwise might not be able to meet, listen to and learn from one another, such as in the panel forum. Deputy Commissioner Ross said the police department and others “need to be intentional on different ways of connecting on issues like this in the community.” But he and others noted that the young men they need to connect with may not willingly come to a community meeting. 1. Why does this article not point out the fact that the audience was not permitted to directly ask questions, nor to raise points directly to the panel. All questions posed at this event were pre-screened. This speaks volumes. As a Holy Family double Alumnus I am disturbed that an institution for higher learning would pay lip service to truly intellectual discourse by banning audience participation and peddling politically correct soft ball questions to the panel. The auditorium was barely half filled. I suspect that since the university’s announcement made it clear that all questions would be pre-screened, that this caused many individuals to lose any interest in attending. 2. What made each of the panelists an expert on race relations? It was very heavily insinuated that the black panelists were experts by the mere fact that they are black. This is itself a racist and discriminatory perspective. 3. The real issue here is not about race. Ferguson and similar incidents are about the exponential and nearly uninhibited growth of the Amerikan Police State. Police brutality and corruption are at an all time high in this country. Americans are being trained to not even look at agents of the state the wrong way, let alone to challenge the government, or to peacefully protest in the traditions of Christ and Gandhi. Today’s police have allowed the power of the badge to go to their head. “Power corrupts, and absolute power corrupts absolutely.” -Lord Acton. And all of the false hero worship doesn’t help either. A man is not a “hero” just because he wears a uniform and does the job for which he is paid. Remember, police are public servants, not public masters. The fact that we are forgetting this is why things like Ferguson happen. Making it a race issue is merely race baiting and provides a useful distraction for the powers that be. As someone who served the citizens of Philadelphia for almost 28 years as a police officer, I must respectfully address some of Lt. Lawler’s points in his response to this article. I can understand why certain conditions, as outlined in paragraph one, would be implemented at this type of gathering in order to ensure orderly communication and decorum. Submitting questions prior to the event allows for ample preparation and constructive discussion. The event also seems to have been designed as a forum to listen to the expert’s discussion, rather than a back and forth from the audience. Speaking of experts, Lt. Lawler asks what made “each of the panelists an ‘expert’ on race relations?” It looks like their backgrounds and experience would qualify them to be on the panel, just as my own experience or perhaps, Lt. Lawler’s would qualify. I don’t see the “insinuation” address in paragraph two. Although I agree, somewhat, with the first sentence of paragraph three, it is certainly for different reasons than outlined here. What makes Ferguson a racial issue was not in the police response to the situation on the street, but a result of the community response and media coverage of the event. It has already been documented that the sad result of this incident occurred directly because of the criminal’s behavior and not the police officer’s actions. Additionally, I must strongly disagree with the rest of paragraph three. We DO NOT live in a police state in this country. Law Enforcement Officers in the United States are now the best trained and disciplined professionals in the world. Every day, Police Officers do more to protect the rights of the people and ensure their safety than any other profession. The fact that there are men and woman in this country who patrol our streets and highways 24-7 and are willing to place their very lives on the line in service to their fellow man is exactly the definition of a HERO. Believe me, no one is doing it for the pay! Check your facts before resorting to rhetorical nonsense. To the contrary, police brutality and corruption are NOT at an all time high in this country. Perhaps you are too young or haven’t read about the events of the 60’s and 70’s.